This is one of a series of Player Q&A's for the Cedar Rapids River Kings. This Q&A was submitted to all 10 IFL teams. We will post those which we have received periodically throughout the season. Thank you to River Kings New Media Coordinator Paige Parker and Co-owner/Advisor Ryan Eucker for assisting in bringing this feature to our readers. Photo courtesy Cedar Rapids River Kings. Graphic by David /SCtoC. Data input by Monika /SCtoC. 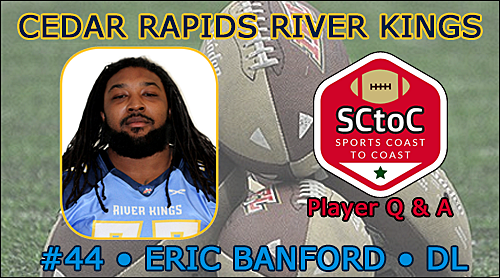 Eric Banford is a 6'2", 275-lb. defensive lineman who is in his fifth season of indoor Football. He played for the Green Bay Blizzard of the Indoor Football league in 2015. Following that, he had stints in Champions Indoor Football with the Duke City Gladiators and Amarillo Venom, and found himself in the upper northeast last season with the National Arena League's Maine Mammoths. Over his professional career, he has totals of 53.5 tackles, nine sacks and four blocked kicks. Banford attended Foothill College and Western Carolina. He hails from Newark, California. 1. What do you consider to be your greatest achievement in football so far? Winning two junior college bowl games. 2. What were your first impressions of the prospect of playing indoor football? I thought is was gimmicky. 3. What was it that made you want to come and try out for the team? (Getting) film; desire to move up. 4. Who has inspired you most in your football career and in life? My Pops and everyone who said I wasn't going to make it. 5. What is your biggest long-term goal for your football career? To play at the highest level and win. 6. What would you like to accomplish this season? I would love a ring, I want to win and I want to get better. 7. What are you looking forward to most about the upcoming season? 8. Please describe how important your family has been to you during your football journey? They are the only thing I have. 9. What is at the heart of your desire to continue your football career? Proving to myself that I do have what it takes. 10. What would you like IFL fans to know about you? That it's only fun when you love what you do and I love what I do. I live for the pressure, I live for the ups and downs, and I live for the fans. I love his responses, especially the last part of the last one, "I live for the fans." Seems like a very straight forward and positive person.